An advantage of the playground metaphor is that it comes with the activity of going out on ‘play dates’ and developing friendships. In such playful relationships, there is always something at stake, but the interaction is also fun and inherently exploratory. In the following, we take a tour of five recent collaborative projects that the TANTlab has participated in. The projects differ widely and testify to different experiences with collaboration and intervention – from a data print on obesity with other researchers to a Facebook-driven intervention in Aalborg municipality’s primary school reform. Thus, we aim to illustrate what we mean by TANTlab as a techno-antropological playground. A visit to the playground inevitably entails that one kid that brought along a cool new toy. She or he will usually succeed in getting the attention of most of the playground – for a while at least. While new toys, or tools, may cause frustration as they inevitably disturb the way play used to unfold, they can also lead to experiments that merge familiar games with new ways of playing. In our introduction, this genre of laboratory play was given the headline ‘Re-tooling ethnography’. An example of such work is a data sprint in 2015 where we worked with an interdisciplinary group of researchers from the Governing Obesity project at the University of Copenhagen (http://go.ku.dk/) on how to appropriate the social medium Instagram as a tool for cultural analysis. A theoretical point of departure was the notion ‘obesogenic environment’ as “the sum of influences that the surroundings, opportunities, or conditions of life have on promoting obesity in individuals or populations” (Swinburn et al. in 1999), which has led to researchers study which and how everyday settings and practices relate to obesity. We drew on a harvest of 82,449 geo-tagged instagrams from the five local authorities in England that reported the lowest average BMI, and five that reported the highest. In a subsequent paper on the sprint (Munk et al, 2016), we presented three suggestions for how Instagram data can be of use for cultural research on obesity. The two first approaches entailed traditional ways of conceptualizing the obesogenic environment. The first by encouraging researchers to view ’Instagram as a camera’ – as a way of gaining visual information about the environmental factors that might influence individuals. The second by approaching ’Instagram as part of the environment’ – as part of user’s everyday practices, almost inevitably leading to field research beyond the medium to gain information on how Instagram gives and holds meaning in everyday life. The third approach, however, suggests that it is impossible to understand Instagram and its users as separate from their environments. Practices such as composing photos, tagging and commenting are not just content production, but analytical practices performed by Instagram’s users, thus working with ’Instagram as analyst’. We therefore moved from an exploration of the productions of individual users to an exploration of co-occurring hashtags (that occur in the same post). In such an exploration, a network of hashtag relations was generated, where the tags were interpreted as part of different communities. 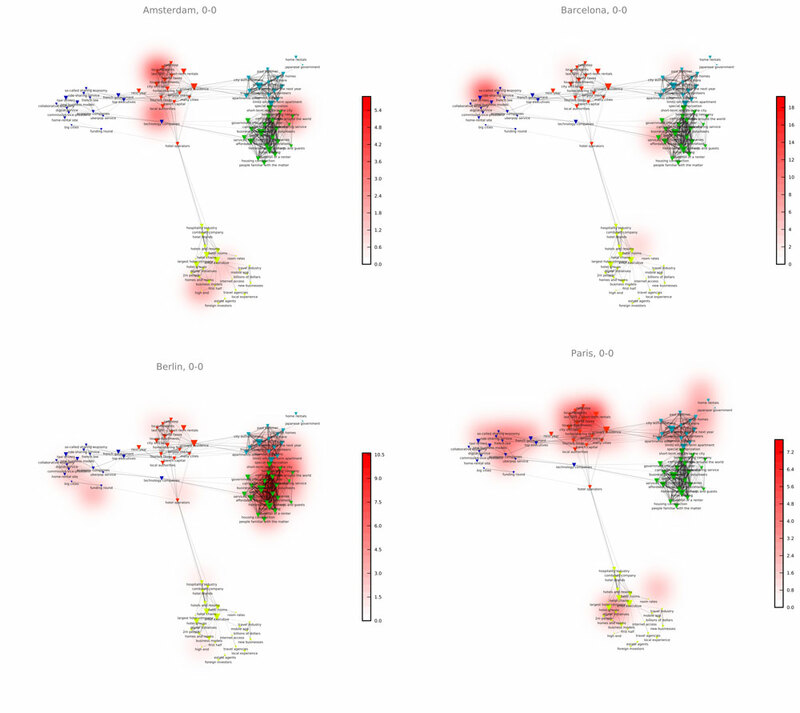 The figure above shows such a network of co-occurring Instagram hashtags in the five high BMI areas. Nodes are colored by local authority (grey nodes representing occurrence in multiple authorities) and sized by degree (representing volume of co-occurrences with other hashtags). The graph was spatialized in Gephi with a force vector algorithm, showing communities of hashtags frequently used together as visually clustered. Especially those hashtags that were ‘media-syncratic’, i.e. used across all ten areas, proved an interesting qualitative context that speaks to a difference in what is instagrammable (deserving of these tags) between geographic sites. The approach provided a promising alternative method for obesity research on Instagram in a cultural analytical context. In August 2016, we did a one-week datas print with The Royal Theater of Copenhagen. The background of the sprint was that the theater experienced a shift in the way they could account for the worth of fine arts in negotiations with politicians and sponsors. Whereas stories and anecdotes had previously been sufficient, the employees found themselves increasingly challenged to ’show’ their value. For instance, it was no longer enough to claim that the Theater ”occupied a specific place in the culture landscape” and had specific ”emotional bonds to its audience”. The aim of the data sprint was to experiment with new ways of datafying such claims. Since both claims are relational – they say something about The Royal Theater’s position in a broader landscape – we thought that digital methods might offer more interesting forms of visibilities than the focus group, which the employees had previously worked with. 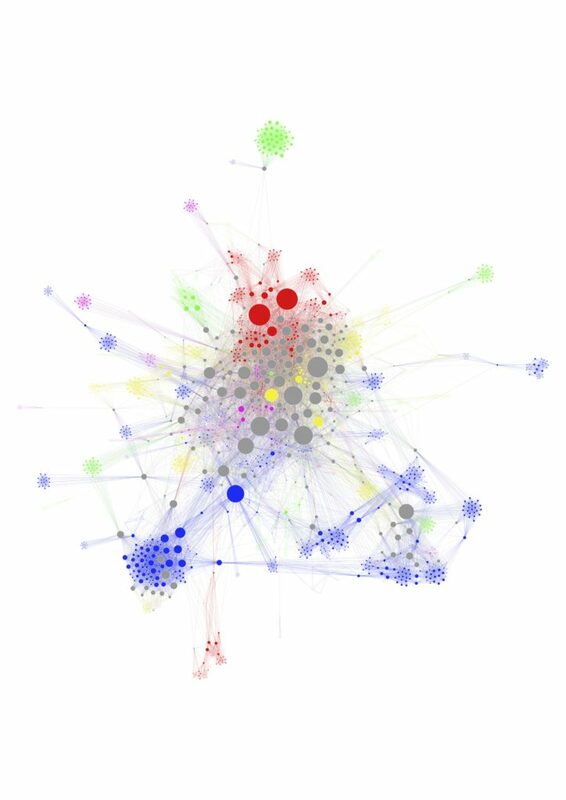 More specifically, we thought that a visualization of the way Copenhagen’ culture users interact with Facebook content on culture, would be an interesting foundation for seeing relations in new ways. At the sprint we tried out different ways of crafting a dataset that could underpin such a visualization. One of the prototypes comprised all posts and user interactions (such as likes, shares and comments) from the Facebook-pages of 550 cultural institutions in Copenhagen. We turned these interactions into a network of posts connected by shared user activity (shown to the left in the figure below). Each node represents a post and are colored by the page they were posted on (e.g. all pages from the music venue VEGA are orange). Nodes are connected if the same user has liked, commented or shared them and are stronger connected if this is the case for more users. 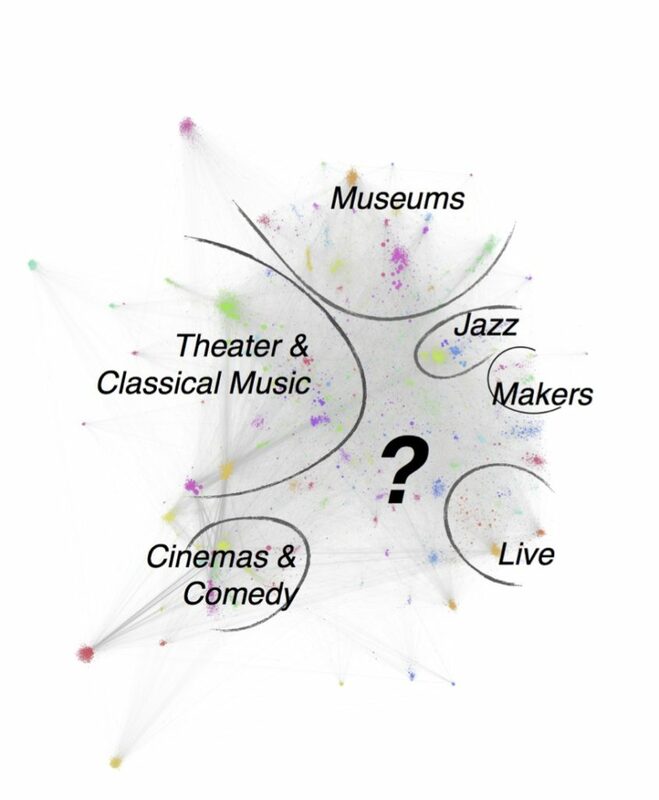 When interpreting the network we found that the cultural users on Facebook seems to be fall into the six clusters of interest written on top of the map. We thought of these as ’post-demographic’ segmentations of these users because they are build on interactions – not demographic variables. A central part of the sprint was to use this map to ask questions and use quali-quantitative methods to zoom in on other interesting aspects of the network. The close connection between the jazz audience and the maker-space was, for instance, surprising and required attention. It is in such ’conversations’ with data that new visibilities can stimulate new modes of thinking and new forms of valuation. For instance, the interaction with data made it clear that the employees of the Royal Theater sometimes had diverging interpretations of the cultural scene. Such differences became visible in mundane practices such a s pointing to places on the map, where they expected a specific cultural institution to appear. Munk, AK, Jacomy M and Madsen AK (2017) Thinking through the data body. In: Mäkitalo Å, Nicewonger T and Elam M (eds.) Designs for experimentation and inquiry: Approaching learning and knowing in digital transformation. Parliaments could seem to be highly issue-agnostic places. All sorts of problems move in and out. But issues make cuts. Some parliamentarians become attached to specific issues. What if the parliament was approached not as a representation device for the national population, but as an assembly of multiple and constantly transforming issue-oriented publics? What kinds of issues come to the fore, how long does this last, and who associate themselves with them? The aim of the Twitter-thing is to trace the cuts issues make in a parliament. Each time a parliamentarian use a hashtag in a tweet, a link is created between that hashtag and the parliamentarian. The tool then generates a network visualization showing how parliamentarians group around topics and issues. The version shown in the screenshot below was developed in collaboration with the Danish newspaper Politiken, which featured the tool and accompanying articles on its website in 2016. The resulting ‘issue publics’ – or things in the sense of a collective aroused by an issue – are also ‘data publics’ because they are not necessarily aware of themselves as publics. At the same time, it is possible to self-select membership of these publics by using a specific hashtag. This raises the question of what feedback loops are at work between visualizations and those being visualized. How might a tool like the Twitter-thing change (parliamentary) politics? More generally, the tool prompts us to think about the fate of issues in institutionalized democracy. The Twitter-thing invites users to explore these questions by making the network available in an interactive format that makes it possible to zoom, search for particular politicians, parties or hashtags, narrow down the network, and follow it over time. It is part of ongoing efforts in digital methods to develop ‘datascape’ navigation tools. Birkbak A, Bornakke T and Papazu I. (2017) The Twitter-thing: Retooling the parliament into issue publics. Exhibition presented at the Data Publics Conference, Lancaster, Great Britain. 31/03/2017 – 02/04/2017. The rise of the collaborative economy has attracted a lot of interest in recent years, not least in relation to travel and tourism, with companies like Airbnb and Uber in the rise. In 2016, TANTlab participated in the production of a report on the topic to the European Commission. The project was headed by the Tourism Research Unit (TRU) at Aalborg University Copenhagen and involved researching and writing a so-called ‘impulse paper,’ which provides academic input to the decision-making process in Brussels. The thrust of the TANT-Lab contribution was to utilize digital methods to map issues related to the rise of services like Airbnb. Airbnb is the most prominent example of how a shift towards a collaborative economy is changing tourism. A key question for the EU commission is how cities respond to this development, how they monitor and regulate this new type of business, and how they cope with or attempt to benefit from the new developments. Recently, services like Airbnb and Uber have caused a range of controversies, also in Europe. In the impulse paper, we explore the issues that have arisen in four major European tourist destinations: Amsterdam, Barcelona, Berlin and Paris. We constructed data sets from Airbnb reviews, from Facebook, and from the news database Proquest. Based on the semantic analysis software Cortext, developed for research purposes by IFRIS and INRA in France, we constructed maps of the ‘issue spaces’ related to Airbnb and visualized how the four different cities were positioned differently in the maps. The discussions and controversies in Paris and Amsterdam turned out to be associated more with tax issues, while Berlin focused more on land use regulation, and Barcelona was more strongly associated with an innovation agenda than the other cities. Each city is represented by its own cell in the visualization above, which uses a heat map technique in Cortext to show how each individual city is related to the overall issue space. The visualization was published as part of the 40-page report, which can be downloaded (link below) and consulted for a closer look at the visualization and the datasets and techniques behind it. Dredge D, Gyimóthy S, Birkbak A, Elgaard Jensen T and Madsen AK (2016) The impact of regulatory approaches targeting collaborative economy in the tourism accommodation sector: Barcelona, Berlin, Amsterdam and Paris. Brussels: European Commission. How do you engage citizens and stakeholders in developing a crowdsourced policy for the future of the public school system in a municipality? This was the challenge facing local politicians in Aalborg, Northern Denmark, when they approached the TANT-Lab together with the consultancy AGORA. It had been decided in advance that the process would have to involve the social media platforms where citizens were already making the school their matter of concern – in this case Facebook – but it was unclear how a messy social media conversation could be fruitfully hardwired into more traditional citizen techniques for public engagement. Anders Kristian Munk and Anders Koed Madsen present the first results of the hashtagged Facebook conversation between 1600 school stakeholders in Gigantium Aalborg on January 8th 2015. Throughout the fall of 2014 we helped the municipality collect and organize interesting conversations from their Facebook page and gradually cultivated a practice of users hashtagging their contributions, according to the themes the discussion had a bearing on, as well as the types of stakeholders involved in it. A school teacher might for example hashtag a post about physical activity in the classroom #physicalactivity #classroom #teacher allowing us to identify emerging thematic clusters in the debate and emerging relations between particular stakeholder groups and themes. 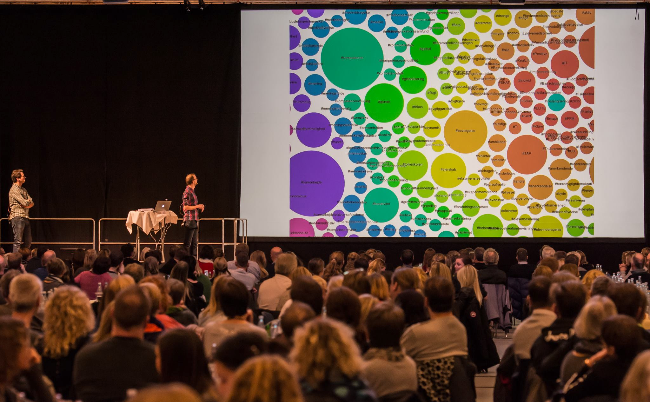 In early 2015 the municipality invited 1600 teachers, pedagogues, managers, students and other staff to a day of collaborative work at one of the major sports arenas in Aalborg. Based on our experiences from the more open ended online conversations in the preceding months we devised a short catalogue of best practices when hashtagging Facebook inputs. Organised around 150 tables the participants were then asked to collectively author visionstatements for the future, post them and discuss them. The result of this work was a database of approximately 1.000 vision statements hashtagged by their authors according to their themes. From the data we identified a number of overarching thematic clusters and central hashtags that were deemed necessary to include in a crowdsourced political vision for the schools. Based around this analysis the database with the full statements was made available and explorable to the 150 school leaders who would sit down and formulate the eventual 2-page policy document outlining the vision. The process proved an interesting experience for the researchers involved. A major reform of the school system in Denmark had preceded the vision process in Aalborg, and the topic was still sparking intense controversy, both locally and nationally. One important feature of opening up a conversation on Facebook was that the roaming issue-public that had sparked around the national reform found a temporary forum in which to express itself. Another and somewhat contradictory effect of these controversies was the considerable political potential with which the conversation was charged, and the implications this had for those participating in the discussion. It was not without consequence to make your voice public under such circumstances. These and other reflections are currently the topic of several paper projects in the lab. Andreas Birkbak is an Assistant Professor in the Techno-Anthropology Research Group at Aalborg University (AAU) in Copenhagen. His research is on technologies in/of democracy, public engagement, and (digital) media. He holds a PhD in Science and Technology Studies (AAU), an MSc in Social Science of the Internet (Oxford), and a BSc+MSc in Sociology (Uni. of Copenhagen). Torben Elgaard Jensen is professor in Techno-Anthropology and STS Aalborg University. He is heading the Techno-Anthropology Research Group. With inspiration from STS he has a broad interest in innovation and knowledge construction practices. His recent work focuses on user-driven innovation and the transformative effects of using digital methods in STS. He is the co-editor of ‘The New Production of User: Changing innovation collectives and involvement strategies’ (Routledge 2016, with Sampsa Hyysalo and Nelly Oudshoorn). Anders Koed Madsen is associate professor in Techno-Anthropology and member of the TANT-Lab executive committee. His research is among other things concerned with digital methods, the re-organization of public engagement in contemporary media environments and the use of new forms of data to guide organizational decision making. He holds a PhD in Organization Studies (CBS), an MSc in Communication & New Media Studies (University of Illinios at Chicago), and BSc in Philosophy and Political Science (Uni. of Copenhagen). Anders Kristian Munk is associate professor in Techno-Anthropology and director of the TANT-Lab. His research interests include controversy analysis and controversy mapping, digital methods in ethnographic contexts, and the interface between democracy and expertise. He holds a D.Phil. in geography from the University of Oxford and has worked as a visiting research fellow at the SciencesPo médialab.